Selling a property because you have too many repairs is extremely common and the reasons for this can vary greatly. For example, you may have taken on a home improvement project to increase the value of your home, be fixing up a home you inherited (going through probate), or have taken on a ‘doer upper’ rental property to finish and rent out. No matter what the situation the cost of repairs can add up quickly. Typically there are three reasons that people don’t get all of the repairs completed in the way they hope to. People often run out of time, money and ideas – or all three! Time is precious and once its lost, its lost forever and cannot be regained. People often call time the most valuable asset of all and one that should not be wasted. We often meet busy people, who have families, successful careers, or businesses that mean they’re little time remaining to take on a refurbishment or repair project. Given time is so valuable, we often ask why they’ve decided to spend it doing repairs on a house that could waste their time and money? A property with lots of repairs can cause months and months of headaches, stress and upset. Take it from somebody whose been managing refurbishment projects for years! Sometimes it can take many months to prepare a house for sale, with a whole team of skilled professionals working on it. We often meet people who have decided to undertake the repairs themselves, which can result in them taking months or years longer than expected. They often say that the project has caused them to miss family events, such as birthdays; others point towards business or careers opportunities lost because they don’t have the time or enthusiasm to take them on whilst doing the repairs! 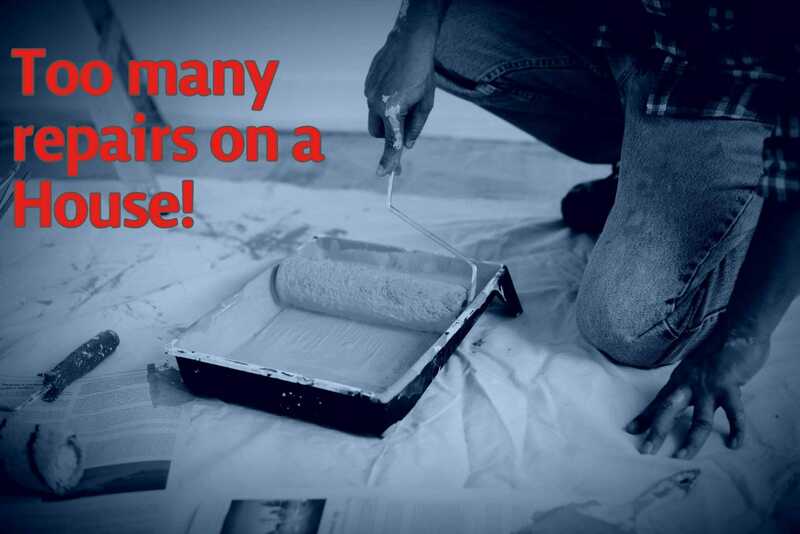 Have you ever run out of ideas when it comes to repairing a house? Its easy to run our of ideas, despite the best laid plans. You may make all of the minor repairs, such as fixing the roof, but what next? Are the repairs you’ve done adding value to the property? What would increase the value of the house? What does your house really need? You could hire some of the great professionals and businesses available to help you – but this comes at a cost, often a large one! Sometimes this lack of ideas can result in extra stress and ultimately lead to project delays. Why worry about who to hire or what repairs would be best? Instead sell your house to a company like us, ridding you of the hassles, costs and giving you back your time. Running out of money is the most frequently stated problem when we meet with a seller of a property that needs too many repairs. Repairs can be difficult to estimate for people who have been refurbishing properties for years – just ask a friendly builder how they build this into their quotes! Often people set out on a project making good progress dealing with repairs they’ve identified, only to discover that the property needs more work than you’d expected. Take a kitchen refurb for example. You may want to change the tiles to something more modern and striking. Depending on the age of your house you may need to replace the kitchen units and worktops as they get damaged when removing the tiles, or are rotten. You may need to deal with unseen electrics running behind the times, where the new tiles are planned to be. This is just one example of a small change turning into a big project. No matter what the reasons for repairing the property, it often happens that one repair can turn into many extremely quickly. This leads to a cycle of repairs, with the more repairs needed the more money required to complete them, eating away at your budget and any returns you may make. The other key point to remember is that only certain repairs will give you a return on your investment. Why worry about running out of money on repairs when you can just sell your house as is, without spending previous time and money? You will run out of money, ideas and time if you attempt a refurbishment project that needs too many repairs. If you live in the Hull, East Yorkshire, or anywhere in the UK and have too many repairs, or a refurbishment project that isn’t going to plan, contact us and sell that house! You’ll have cash in your bank in as little as a few days, more time and less stress and hassles!